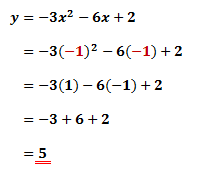 Find the coordinates of the vertex of y = -3x2 -6x + 2. Now, we can substitute the equation with span class="bold text-gold">a = -3 and b = -6. By doing so, we can solve for x. The y-coordinate of the vertex is 5. Therefore the coordinates of the vertex is (-1,5).